Turkish Mystic Sufi musician Latif Bolat will present music, poetry, Sufi mystic stories and images from the ancient land of Turkey. 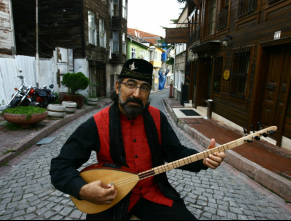 Latif Bolat plays Turkish Folk Music and devotional Sufi songs which are called Ilahi and Nefes, from the Anatolian peninsula. The lyrics of Ilahis or Nefeses are taken largely from the great mystic poets Yunus Emre, Niyazi Misri and many other ancient troubadours of Turkey. The program also includes sacred ballads composed by Latif Bolat. Throughout the program, devotional poetry will be recited from 13th Century Sufi poets Yunus Emre and Rumi, and images of Turkish people and scenery will be reflected on a screen. One of the most well-known Turkish musicians in the US, Bolat possesses a vast repertoire, ranging from Sufi devotional songs and Turkish Folk music to classical pieces. His mesmerizing performances draw on ancient texts and employ traditional instrumentation such as the baglama (long necked lute), and he is often accompanied by other Turkish traditional instruments such as oud, bendir and ney flute. Now residing in New Mexico and Turkey, Mr.Bolat has presented his music all across America, Canada, India, Australia, New Zealand, Indonesia, Singapore, Bulgaria, Turkey, Philippines, England and many other international locations. In addition to his Carnegie Hall concerts and lectures, he has recorded 4 very successful CDs, made many TV and radio appearances and composed music for the PBS Documentary “Mohammed: Legacy of a Prophet” and George Lucas’s TV series “Young Indiana Jones”. He is also the co-author of a Turkish Sufi poetry book titled “Quarreling with God” which is published by White Cloud Books (Oregon, 2008). twice the inspiration, half the price!